I've mailed off a chunk of the commissions I took a couple of weeks ago. I still have three left to do, but seven should have, by now, reached their owners, so I'm throwing them up here. All of them were drawn at 5 x 7" and for some of 'em I used gray markers, which I almost never do on brush drawings. I liked how they turned out! One of the requests was a self-portrait. I haven't done one of these in a while, and I was never good about making them look like me. This one, I think, looks like me, so that's good. 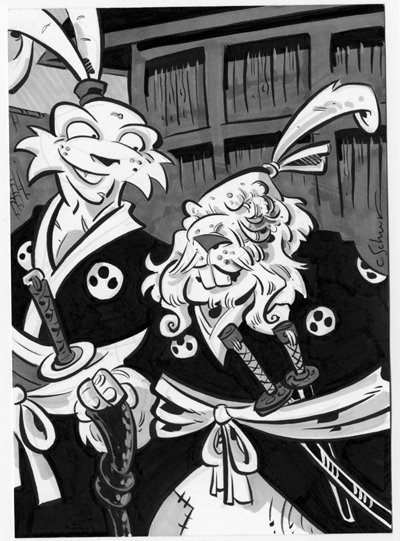 I was also asked to draw Stan Sakai with his comic creation Usagi Yojimbo. I did a few sketches of Stan during his visit to Atlanta a few months ago, and looked at these to do the drawing - I never actually looked at a photo! I thought him holding a real rabbit DRESSED like Usagi would create a more interesting drawing than him standing with the character, so here you go. 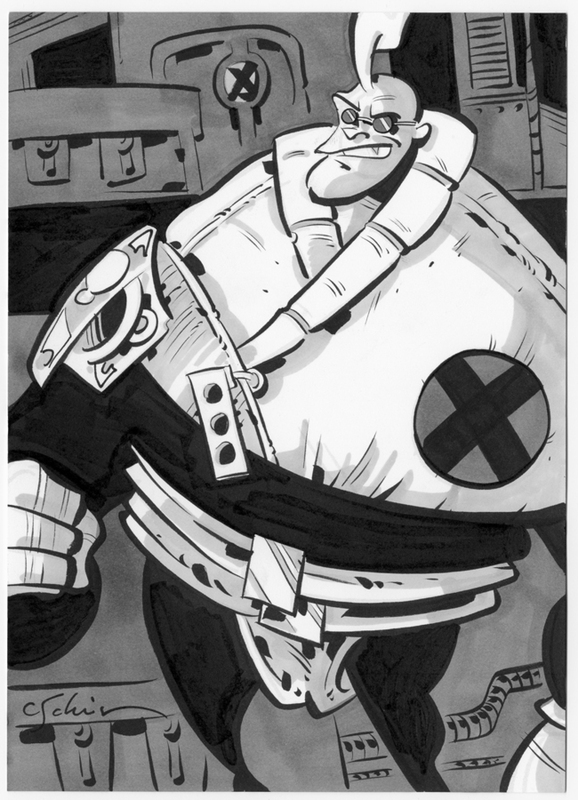 Here's Strong Guy from X-Factor. I had an action figure of him in sixth grade, and I really liked it. I got another request for "Something Usagi," so I did a picture of Usagi and Jotaro in 1632, 30ish years after the events in Usagi Yojimbo take place. 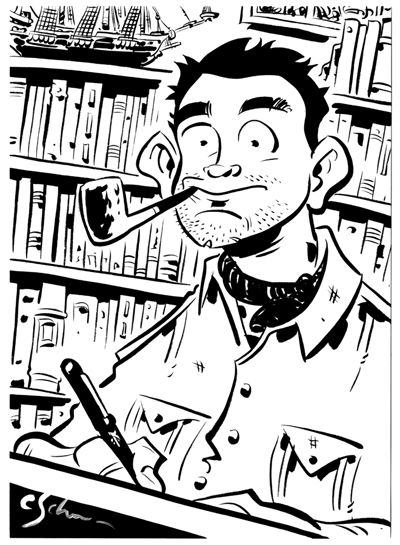 I love drawing established characters old; I can see why all of Allan Moore's books are about what they're about. 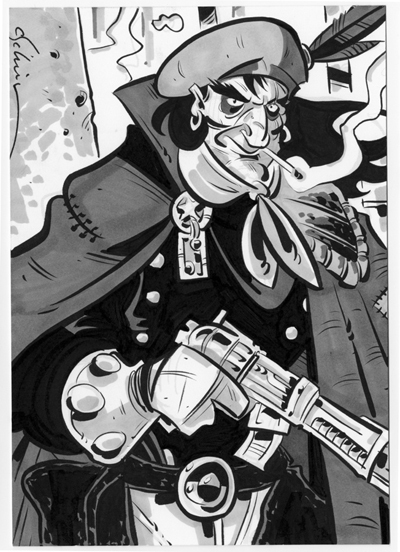 Grimjack, who was commissioned by the guy who ran the comic shop in my hometown where I probably bought the aforementioned Strong Guy figure back in sixth grade. And, lastly, Shipwreck and Beachhead from G.I. Joe. Just a reminder, there is a sketchbook release/signing on Thursday! I'll have my new book - though the retail is $20, at this signing it'll be $15 to the public and $5 to anyone with a valid SCAD ID or Crogan Adventure Society agent card. Thursday, May 26, from 5-8pm at SCAD Atlanta, right next to the front doors (Gallery 1600). SCAD's address is 1600 Peachtree ST NE, Atlanta, GA 30309. Hope to see you there! 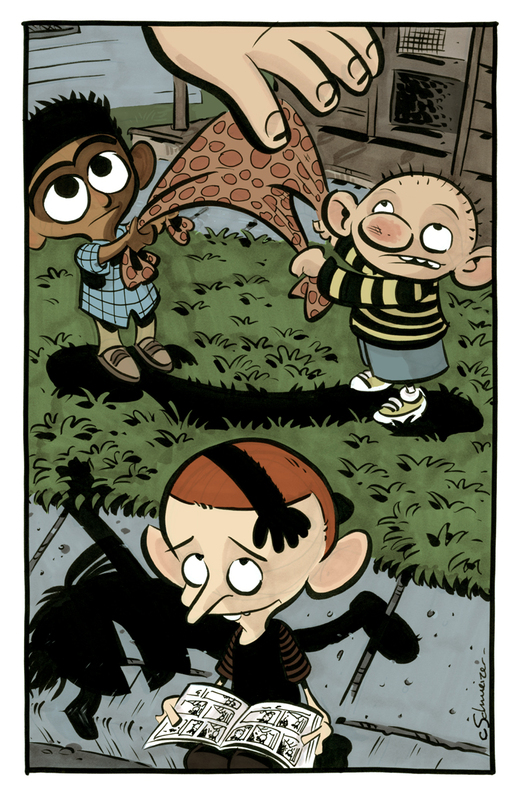 As some of you might know, Richard Thompson's Cul de Sac is without question my favorite comic strip from the last decade. 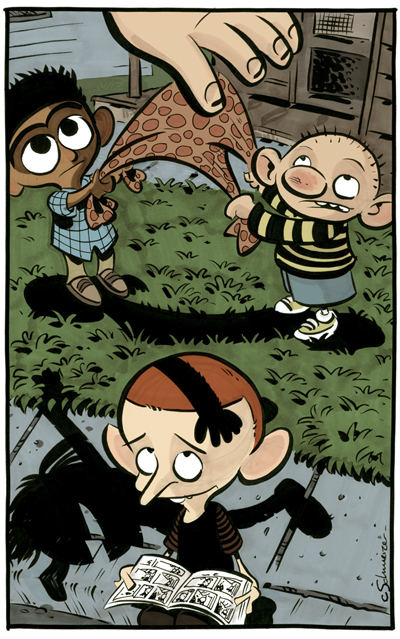 It does a better job of capturing the essence of children than just about any other narrative I've ever encountered. It's phenomenal. I can't recommend it highly enough. If you're a fan of Calvin and Hobbes or Peanuts, you should be picking up these collections. I'm lucky enough to have an original hanging on my wall, and it's one of my most prized possessions. Last year, Richard announced that he has been diagnosed with Parkinson's Disease, a deginerative nervous system disorder that often manifests itself in uncontrollable tremors and shaking, which is terrible for anyone but is especially horrifying for someone whose job and passion is to have pretty much infallible control over his or her hands. Luckily, he seems to be doing well and is still perfectly capable of making some of the most wonderful comics ever produced. I got to join Richard and a few friends for dinner last year in Charlotte, and with us was Chris Sparks, one of Richard's friends and the fella in charge of his web page. Chris has since taken on the task of preparing a benefit for Richard called Team Cul de Sac. 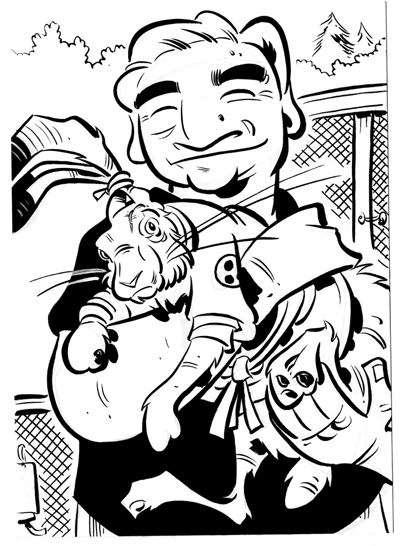 Cartoonists of all stripes are doing their take on characters from Richard's strip. Some of the art will be collected into a book being published by Andrews McNeel, and all of it will go to auction. The money will be used for Parkinson's Disease research through the Michael J Fox Foundation, whose stated mission is to cure the disease. As soon as I find out details about the auction, I'll post them. There will be a lot of great stuff on there. 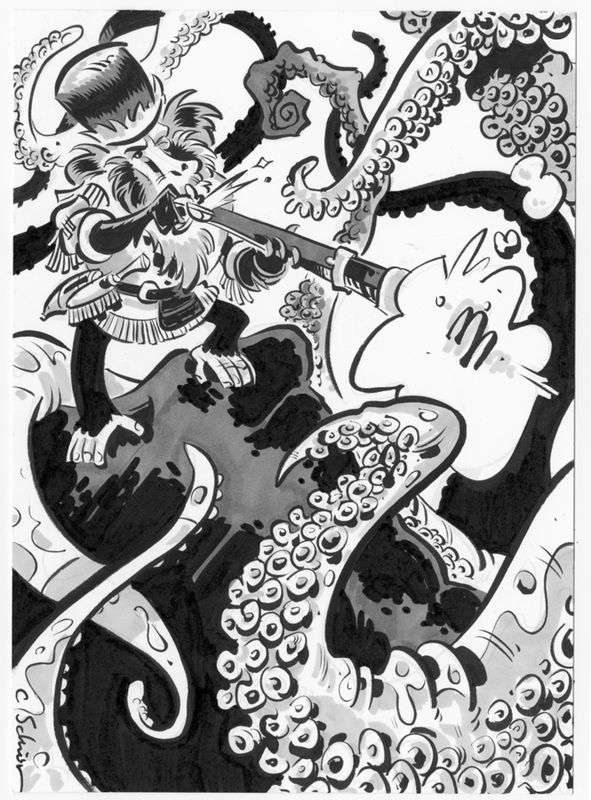 I do want to note that, in order to ensure that the piece raises as much money at auction as is able, this will be the only Cul de Sac drawing I will ever do, or at least the only one that will ever be available for sale. Again, I'll be sure to let everyone know details about the book and auction as soon as I know them. One note - the drawing is actually in gray marker wash; I added the hues digitally, after seeing that many other contributing artists had done the same. If any cartoonists wish to contribute and have not yet done so, fret not; the deadline has been extended to June 18th. 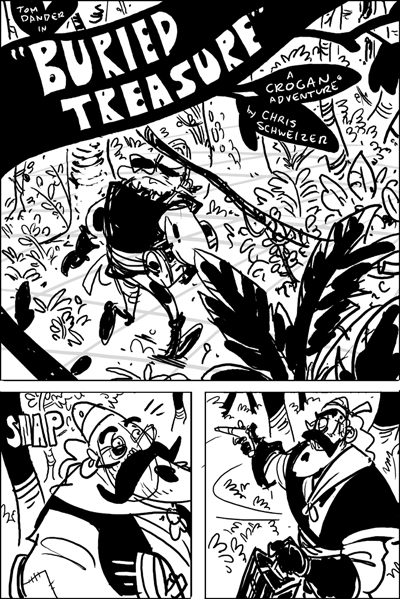 The Dollar Bin is putting out an anthology at HeroesCon called "Buried Treasure," and asked if I'd do a story. I said yes. To get a sense of the foliage. I bought the Crusoe TV series. I was going to go to the Atlanta Botanical Gardens, but it cost almost twice as much, and as I wasn't sure that they'd have what I needed I opted for the cheaper avenue. It really bothers me that nothing in Atlanta, ostensibly a legit metropolis, is free to the public. The zoo, the aquarium, the museums, the gardens, etc... all are fairly expensive (usually near twenty bucks for a ticket, sometimes substantially more). Though it's a pirate story, there won't be any ships or ocean. But it does set the scene for the next book with Catfoot in it. 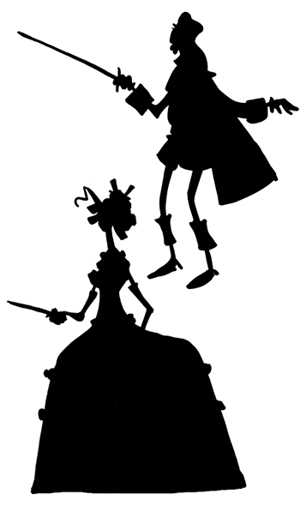 For this week's Silhouette Sundays installment, I present Alexander Dumas' The Three Musketeers, along with a couple of their foes, Milady and Rochefort. I know I should have included D'Artagnon, but man, I tried him like eight times and couldn't get it. And since this isn't for anything (meaning future projects) I can't really devote a lot of time to nailing one that's trouble. Maybe he'll end up in a future installment. I DON'T USE THIS BLOG ANYMORE. THIS PAGE IS DEAD though I'll leave it up as an archive. 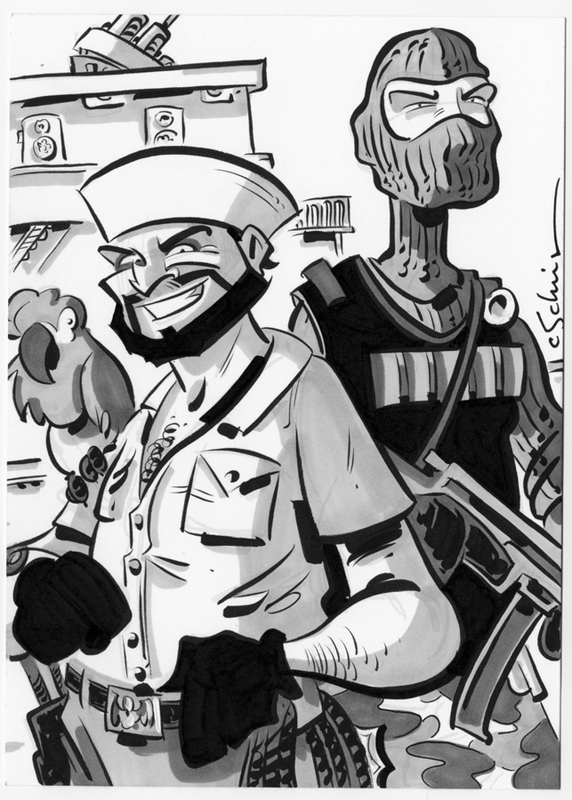 This is the new blog, THE CROGAN ADVENTURES. Click here!